How long have you worked at the Cheese Lady? – I’ve been working at the cheese lady for roughly 5 months but had a passion and knowledge of about cheese for some time before becoming a part of the team. Favorite cheese (today) and what you like about it – Le Cremeux is my new favorite cheese! I was surprised I liked it since it was a gruyere style. It’s creamy with a semi soft texture, and it almost melts in your mouth. Favorite movie – My favorite movie is Memoirs of a Geisha, it came out in 2005 and directed by Rob Marshall. The Cinematography is absolutely breathtaking and kindled part of my love for Japan. The characters and story make a very touching tale. Beautiful movie. What do you like best about working at the Cheese Lady? The store is charming and my co-workers are nice, helpful, and hardworking. Learning and Knowledge are only two things I am passionate about, therefore applying it to cheese makes working at the Cheese Lady interesting and enjoyable. 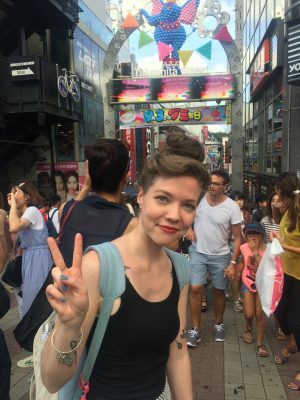 Personal tidbit of interest about your life outside of The Cheese Lady – This past summer I fulfilled my lifelong dream of visiting the country of Japan for the first time! It won’t be my last!